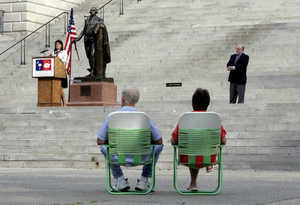 Paul Waldman at Tapped passes on this photo of a Tea Party rally in South Carolina. Donald Trump was expected to speak, but he cancelled. They still had Governor Nikki Haley, who appears to be at the podium. She attracted a crowd of about 30. This kind of thing makes me feel pretty good about Democratic chances in 2012. We're going from a midterm election where young Obama fans didn't turn out in large numbers and the GOP base did to a presidential election with a very different electorate. There HAD been a big crowd there, but everyone else was Raptured!